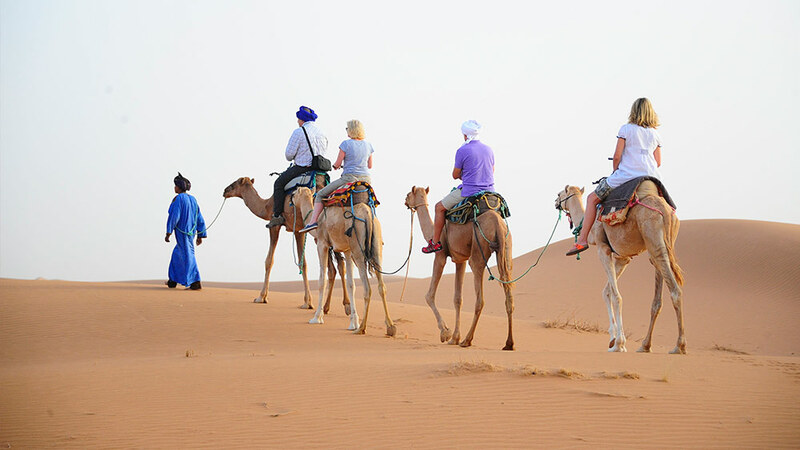 €540 per person for 4 days tour with 1 night at Berber Camp. The Arabic name given for Morocco by medieval historians and geographers is “al-Maghrib al-Aqsa”, translated as Furthest Westerly Kingdom (of the Maghreb countries in North West Africa). Morocco is just 13km from Spain but it’s smaller than its neighbour, despite its territory bordering 3500 km of the Atlantic and Mediterranean coastlines. 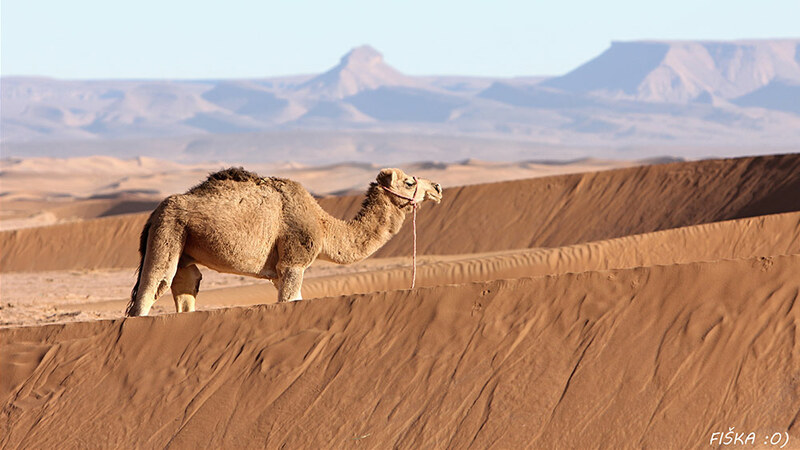 Heading south-east from the Atlantic coastal resorts, follow this desert tour from Agadir, Essaouira, or Taghazout and loop through the Sahara Desert. Then travel north across the Anti Atlas and High Atlas mountain ranges to reach Marrakech. The itinerary below can be extended with an additional night in the desert at Erg Chigaga Great Dunes. Transfer down from Essaouira to the desert frontier (at the town of Foum Zguid) before the desert off-roading begins. The drive time will be around 8 hours, but with a morning start from Essaouira the journey will not be rushed. 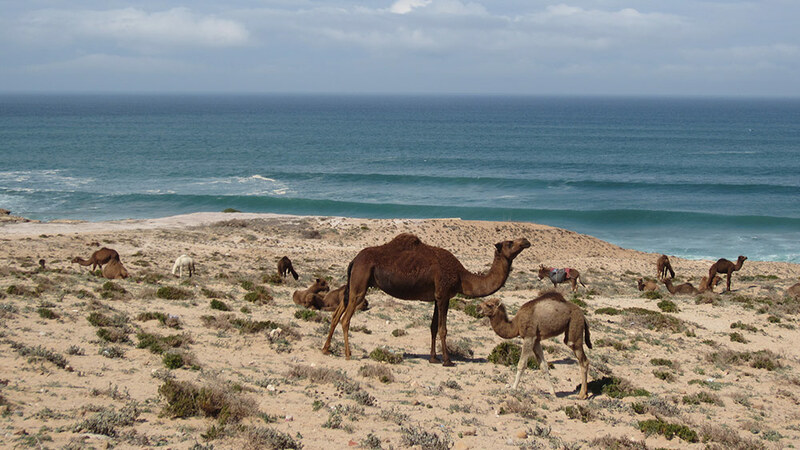 Drive through the Argan tree biosphere south of Essaouira and then along the coast road towards Agadir. 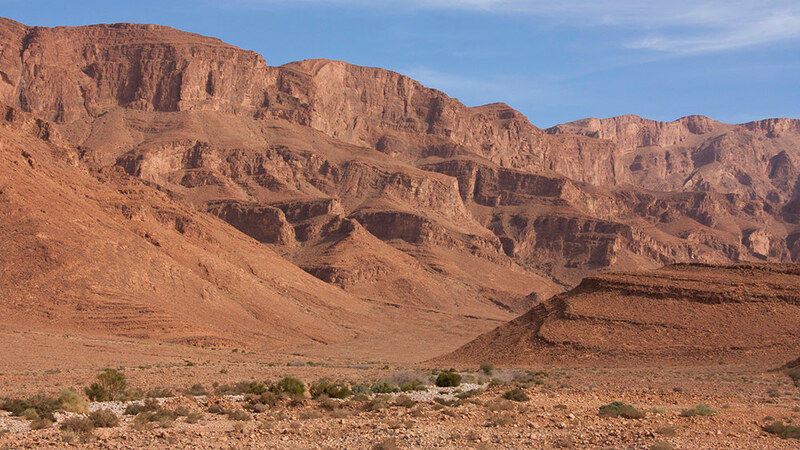 After Agadir, pass via the medieval walled town of Taroudant on the broad Souss River plain, thereafter gaining height gradually as you wind your way through the Anti-Atlas mountains. Overnight just outside Foum Zguid at a comfortable guest-house with modern amenities. Today, you’ll be able to enjoy a full day in the desert and reach your camp at the Great Dunes of Erg Chigaga in time for lunch. The off-road journey to the camp from the end of the tarmac road is 3 hours. You’ll be driving through some magnificent remote scenery, via Acacia tree groves, across fossil beds, and the dried salt lake of Iriqui, and then through deeper sand as you join the dune field. After lunch at camp, take a camel-trek to explore part of the great dunes, and then walk across the sands to admire sunset from a vantage point. In the evening, the staff at camp play music and sing at the fire-side once dinner service finishes. Complete the evening with some star-gazing from the dunes. 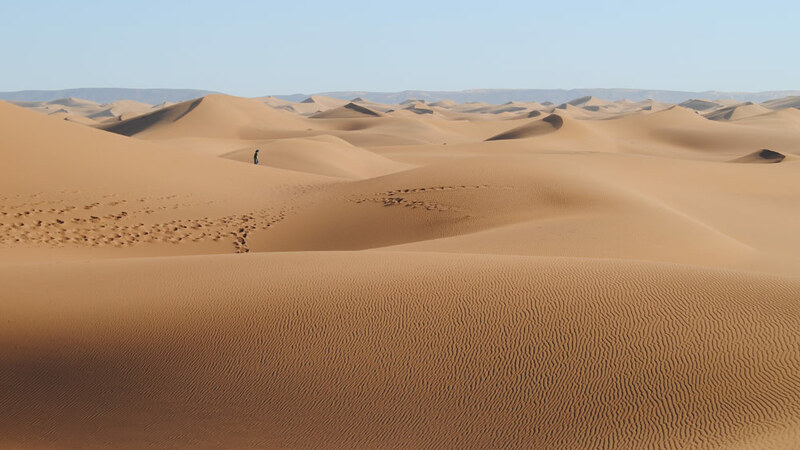 We offer a choice of desert camping at Erg Chigaga Great Dunes; either in rustic Berber tents or in Deluxe, fully-furnished tents. The camps are small (7-9 tents) but if you prefer a more exclusive experience we can establish a private camp with simple comforts. Leaving the great dunes to the east, after breakfast, enjoy a further 2 hours off-road journey to join the next road at the village of M’hamid, on the Draa Valley. 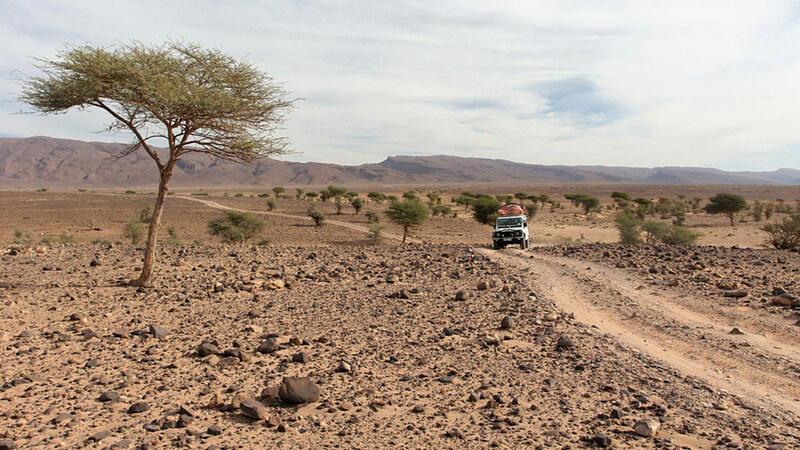 Follow the course of the Draa northwards, admiring the vast palm oases and crumbling kasbah ruins which are flanked on either side by the Anti-Atlas mountains. Gaining height after the town of Agdz, cross the outer reaches of the Anti-Atlas range before descending to Ouarzazate. We suggest you overnight outside Ouarzazate and in the picturesque Ounila Valley, close to Ait Ben Haddou. Spend the night in a restored kasbah guest-house. Journey time today approx. 6 hours. After breakfast, if time permits, you could take a guided walk in the Ounila Valley before setting off for Marrakech. 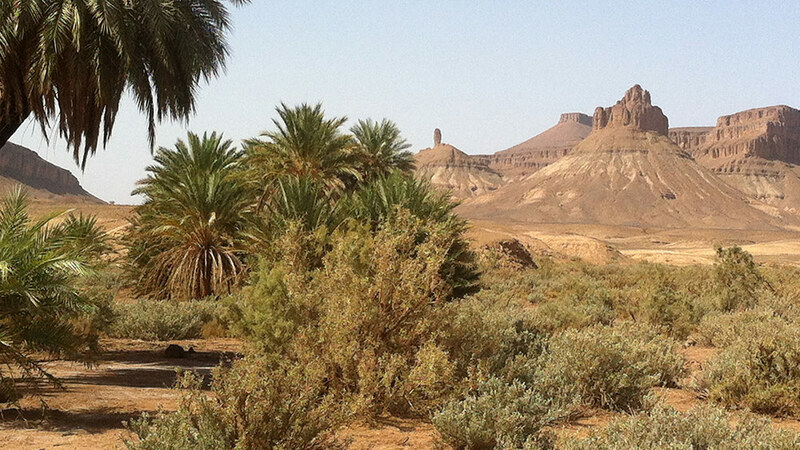 Follow the single-track road northwards, gaining altitude before stopping at Telouet to visit the kasbah ruin. From Telouet join the main road crossing the High Atlas mountains and the winding route passes via typical villages and lush valleys on its descent to the Marrakech plain. Expect a journey time of approx. 5 hours. guided camel-trekking out from camp.